So I was interested in reading Broken Monsters because it’s set in Detroit (I lived in the metro area for over 10 years), but I was unsure about a crime novel written about a crime-ridden city and written by someone from South Africa. What I mean is that crime fiction is a bit escapist, and Detroit itself is so riddled with crime that I wasn’t sure what kind of approach Beukes would take. Well, the answer is a bit of a sci-fi/horror approach to the central crime (a boy’s torso is found attached to a deer’s legs), and a large set of characters in the city whose voices feel fresh and real. Broken Monsters spends a great deal of time with Detective Gabriella Versado and her teenage daughter Layla, but this is not a book that focuses on the police procedural aspect of this hot-button case. Beukes also tells the story of Detroit and investigating the horrific murder through a few homeless characters, some artists, and a journalist new to the city and new to embracing social media to tell the story about the murderer. In the meantime, there are several setpieces involving an Arts and Crafts period pottery studio (inspired by Pewabic Pottery) and huge art parties/ installations in neighborhoods reminiscent a bit of the Heidelberg Project. Part of the pleasure of the book was the voices of all of these disparate characters, and part of it was because of the bits of Detroit Beukes got right–the urban ruin explorations, the artists, the pottery studio And it was a serial killer story that was so out there that it felt fresh. Finally, I appreciated how good Beukes was at capturing her teenage characters’ voices. Layla and her friend Cas feel quite real, and that stood out to me especially after having mixed feelings about the last book I reviewed. Finally, I want to highlight a couple Detroit items: first is a Reading Detroit list especially for its nonfiction section. The Arc of Justice is a fabulous book that captures Detroit in its boom times and a great legal story about Ossian Sweet, a black doctor accused of murder. 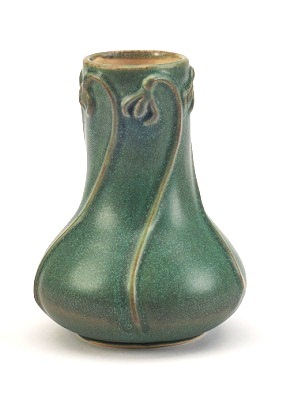 And finally, I leave you with a photo of a Pewabic Pottery vase that I’ve given a few times as a wedding present, proof that there is more to Detroit than crumbling buildings. Rebecca – Detroit really is more than crumbling buildings. The home of one of the most influential forms of rock-and-roll, it’s a fascinating place. I’m glad it’s featured in this novel. It sounds a little off my proverbial beaten path, but that isn’t necessarily a bad thing. Thanks for your thoughts on this. I was a little leery of the book too after just reading the description, but it was quite gripping, and not just in a gruesome-crime kind of way. The story sounds gruesome…so I appreciate you for reading it for me. Also, thanks for sharing something positive on Detroit. You’re welcome: and it didn’t feel so gruesome to me, and I’m not sure why. I’m not sure I’m ready for Beukes’s previous book about a time-travelling serial killer, though.